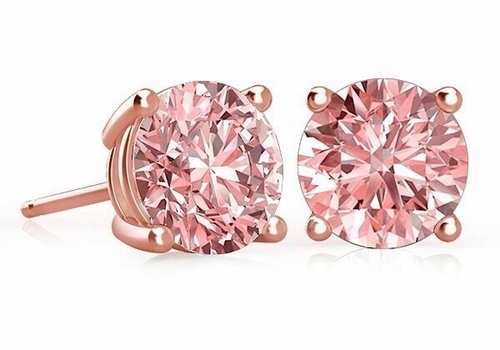 These amazing 2 Carat Each Round Cubic Zirconia Stud Earrings Set in 14K Rose Gold will make for the perfect addition to your jewelry collection. The exquisite beauty of rose gold is derived by the addition of special alloys to the already precious 14k gold metal, creating the rich and warm pink hue. The earrings are 4 carats total weight and each round lab created laboratory grown diamond quality stone measures 8mm in diameter. The stones in these stud earrings are hand set in the popular four prong, slightly tapered basket setting, allowing each stone to receive maximum light to reflect through the stones. 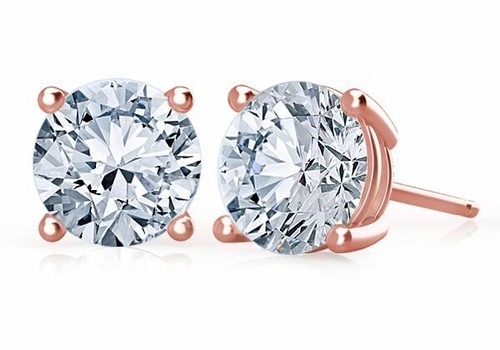 Not only can you order these rose gold stud earrings with brilliant white diamond look stones, you can also have them custom made with 2 carat each pink diamond look cubic zirconia stones. The pink diamond look stones set in the luscious pink rose gold metal makes for a winning and stunning combination. 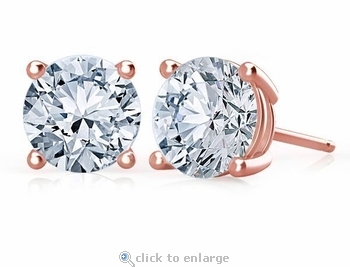 These rose gold stud earrings come with standard push posts and push backs. You can upgrade to have them made with threaded posts and matching screw backs or you can choose the ultimate support and security with our jumbo large earrings backs, see the drop down menus for all your options. These rose gold earrings are custom made and are a special order item final sale. These rose gold earrings are custom made and are a special order final sale item.